In dynamic river systems, effective and sustainable risk management of sediments, contaminants and their sources must be carried out on a river basin scale. A diversity of interests and risk perceptions, whether environmental, economical, or personal, as well as the broad variety of uses and functions of river systems can lead to conflicts and disagreements about how and where river systems should be managed. This requires a transparent methodology to assess environmental risks in the river basin, followed by a prioritisation of those sites where measures would yield the highest positive effect for the river basin and where financial resources could be allocated most efficiently. However, risk perceptions may only partially be influenced by scientific assessments of risk, and often also depend on a variety of factors such as personal experience and confidence in institutions. Risk managers must develop methods to balance technical and socioeconomic issues with the aim to reduce risks posed by sediments to environmental and economic resources to a level that is perceived as tolerable by society. 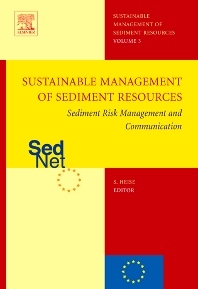 Sediment Risk Management and Communication (Vol.3 in the SEDNET mini-series) is based on discussions that were held in the working group on "Risk Management and Communication" which was one of 4 working groups within the European Demand-Driven Sediment Research Network "SedNet". It aims to analyse the current situation in Europe with regard to sediment risk management issues, to draw conclusions from this analysis and to offer recommendations for sustainable risk management from basin to site-specific scale.